The 2018 Arnold Amateur Finals for bodybuilding, fitness, figure and bikini on Saturday, March 3 with LIVE STREAM HERE. 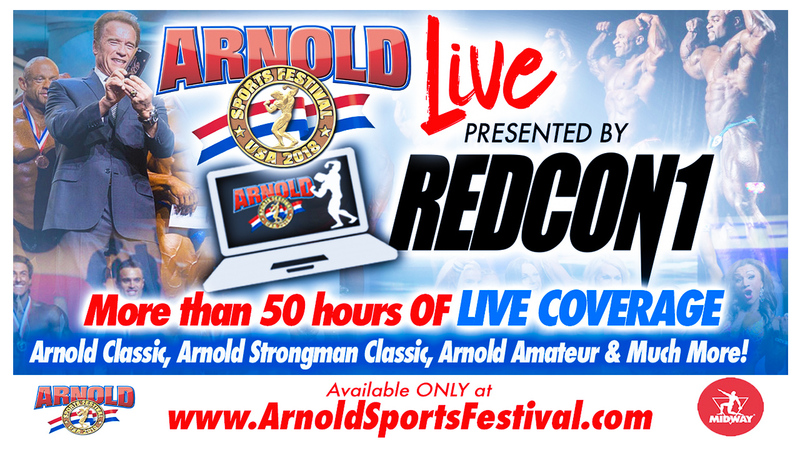 The Arnold Fitness EXPO Main Stage will LIVE STREAM HERE on Friday, March 2; Saturday, March 3 and Sunday, March 4. Saturday, March 4, 7-9:30 p.m.: Arnold Classic, Bikini International & Men's Physique FINALS and Arnold Strongman Classic Final Event. The 2017 Arnold Sunday Showcase Featuring Gov. Arnold Schwarzenegger and Arnold Classic and other IFBB Pro League champions will LIVE STREAM HERE from 10 a.m.-1 p.m. on Sunday, March 4.